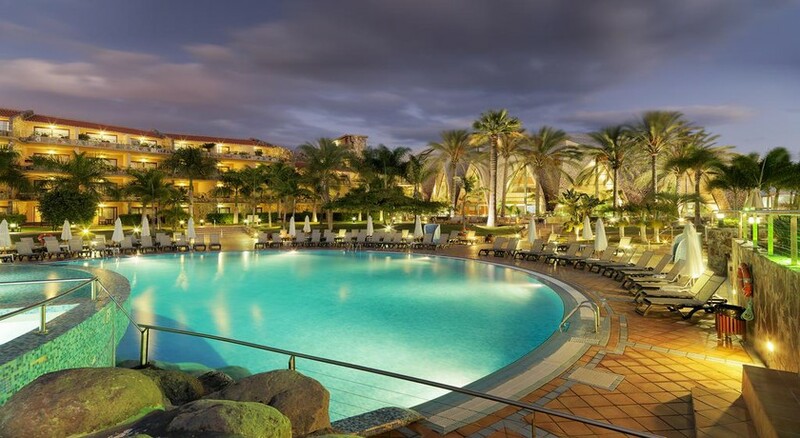 Situated in Meloneras, south of the beautiful island of Gran Canaria, the sophisticated and elegant H10 Playa Meloneras Palace is great place to spend a beach vacation with your family or friends. The location is ideal for those who are seeking peace and quiet, for the hotel is nestled in a tranquil corner of the island and is close to a number of golfing courses. It is known for its impeccable services, classy, understated elegance and carefully selected menu. It has 373 rooms, two adult pools, one heated infinity pool, an outdoor Jacuzzi, an internet corner, a boutique and a games room. Wi-Fi is free throughout the premises, so that you can always connected with the outside world through social media. While adults go for pampering session at the Despacio Spa Centre, kids can have fun at the playground and mini disco at the Daisy Club. If you are looking for a quiet beachfront hotel that comes with all the necessary amenities and services and is also near the city centre, then there is no better hotel than this one. 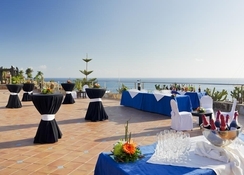 H10 Playa Meloneras Palace is 35 km from the airport. Las Palmas de Gran Canaria is the nearest big city, situated at a distance of 60 km. The hotel is just a stone’s throw away from the Playa de Meloneras beach. The stunning beaches of Playa de Maspalomas and Playa del Ingles are also quite nearby. The bright and airy rooms of the hotel ensure that your stay in the hotel is a comfortable one. The rooms have a functional décor and are equipped with a range of amenities. They come in various categories: Double Room, Double Room Sea View, Privilege Superior Room Suite and Presidential Suite. While some rooms have a wonderful view of the sea outside, others afford stunning views of either the hotel garden or the swimming pool. Standard amenities available in all rooms include flat-screen TV with satellite channels, Wi-Fi, air conditioning, safe box, fridge, writing desk and furnished terrace. 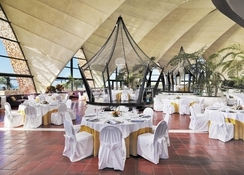 Guests can enjoy a delicious range cuisine, including sumptuous buffets and specialized a-la-carte menus, in the hotel. 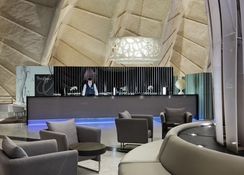 Some of the most famous restaurants of the hotel include Tamadaba buffet restaurant with outdoor terrace and show cooking, the a la carte Gaudi restaurant and the La Choza restaurant by the pool that serves a la carte snacks. Among the bars, Tropical Chill Out is a poolside lounge bar with sea views, Lobby Bar features live music and Tirajana Disco Bar offers great evening entertainment. If you are a golf enthusiast, then you couldn’t have asked for a better hotel. H10 Playa Meloneras hotel stands in proximity to some of the best golf courses of the island, including Meloneras golf course, Maspalomas golf course and Golf Salobre. For water lovers, the hotel features 2 adult pools, heated infinity pool, heated children’s pool and outdoor Jacuzzi. There is also Daisy club, which has an entire programme dedicated to children between 4 and 12 years of age. 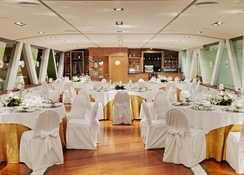 The hotel also organizes weddings, business meetings and social gatherings. Special packages at attractive prices are offered. 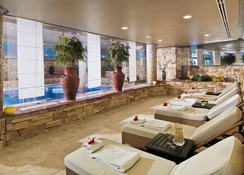 Guests can also treat themselves to a day of relaxation, beauty and wellness at the hotel’s Despacio Spa Centre. Forget all your worries, as you relax in our water area and let yourself be pampered by a personalized treatment by the spa’s team of professional beauticians and massage therapists.The choice for sports and entertainment is staggering. The Luxor Spa & Fitness Centre is one of the popular health and beauty centres in Benidorm. It has a fully equipped gym area and provides a range of exclusive beauty treatments and wellness packages for its guests. Levante Club Golf is another great venue for both amateur and professional golfers. The 420-seater salon is the perfect place for either holding a business meeting or getting married. Finally, the nearby beach provides the perfect opportunity for friends and families to hang out, relax and enjoy the summer sun. This hotel was truly fantastic. 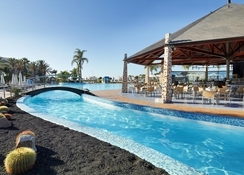 It was our first visit in July but we know the island and the area very well but the rooms, the pools and gardens and availability of sunbeds etc was just perfect. We did all inclusive and the food was great. We will be going back on a regular basis I think. Would definitely go again. One of the most relaxing holidays we've ever been on. Great Holiday! Really enjoyed H10! Very clean, everything was all taken care of. Great food.Chilled out time with family!